Howdy people, thanks so much for the awesome advice in this forum, I have been reading through it for the past few weeks and it has helped immensely in our planning. We are leading a group from Tuolumne Meadows > Cathedral Lakes > Sunrise Lakes > Clouds Rest > LYV > Happy Isles starting June 15th. After reading through a bunch of the posts I was able to gather that we will be dealing with some snow/slush, navigation issues, mosquitos and the horrible new hiker bus issues. 1. I was wondering if there will be any creek crossing issues like the ones mentioned at Tenaya Lake/Creek? 2. Anything else to know about along this trail or unique things to bring? Thanks to this forum I will be bringing mosquito nets and microspikes. No creek crossings to be concerned over. Certainly nothing you can't easily go over or through. Wet trails for sure. Hopefully not much snow except for a few patches, but I hear everyone saying it's staying pretty stable and solid for most of the days. I wouldn't bother with the spikes. We're going to 9900 ft this weekend, and we're not. What we are bringing is neoprene socks, maybe our gaiters, and probably our trekking poles. And along with our head nets, DEET! Lots of it!! Phil wrote: No creek crossings to be concerned over. Certainly nothing you can't easily go over or through. Wet trails for sure. Hopefully not much snow except for a few patches, but I hear everyone saying it's staying pretty stable and solid for most of the days. I wouldn't bother with the spikes. We're going to 9900 ft this weekend, and we're not. What we are bringing is neoprene socks, maybe our gaiters, and probably our trekking poles. And along with our head nets, DEET! Lots of it!! I'll be interested in the snow report, Phil. Drewgol, this is something you might want to refer to for your trip, too. drewgol wrote: 2. Anything else to know about along this trail or unique things to bring? Thanks to this forum I will be bringing mosquito nets and microspikes. Phil, hope your trip this weekend is good and I would also be interested in the snow report. Thanks for the snow forecast link that is great only took me 15 minutes to finally got my bearings with the little black boxes showing TM and Tenaya Lake, haha. maddiver, Great tip on the last spot to fill up water for CR. I am printing that map for sure. We are going to try and camp on top of CR, i read a trip report saying there are a few flat spots up there. Any experience camping up there? wind exposure might be an issue. 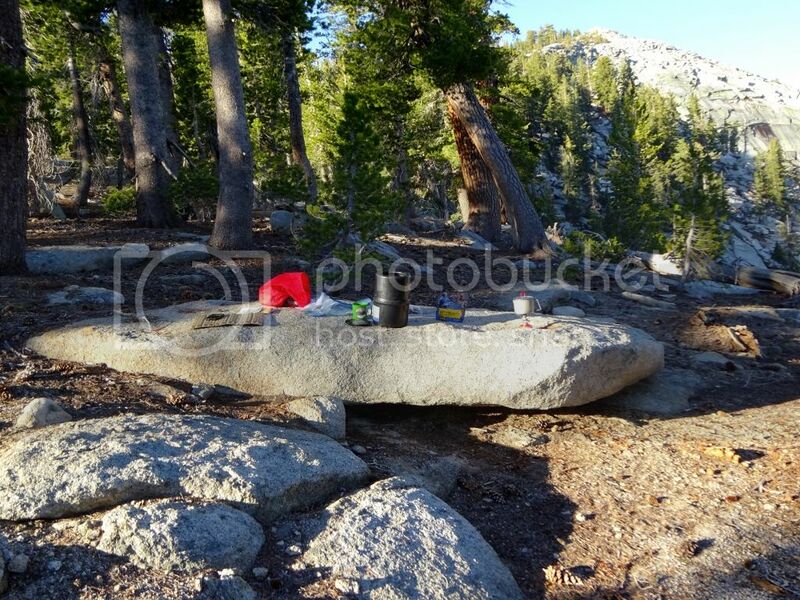 Instead of LYV, find a site at the JMT/CR trail junction at Sunrise Creek. If you do end up taking that upper trail that both MD and I mentioned to the north of the ascent up to CR (called the Forsyth Trail), as soon as you hit the JMT, go left and along Sunrise Creek for the best sites in the area. It looks/sounds like this would keep us from the crowds in LYV and we would be a little closer to half dome, making it easier to get up there before the crowds. do those sites along sunrise creek (jmt/cr junction) have fire rings? You can camp at the top of CR, kinda, sorta legally, but space is extremely limited and the summit is really exposed. More than a couple people and you might as well not even commit. No place to really anchor the tent either unless you're using rocks. Plan on using your guy lines. I've done it and spent the night with my lightweight tent buckled over on top of me, seen others do it, but you're better off staying lower and actually enjoying a better site and just walking up in the morning or evening without your packs on, especially with a group. From an etiquette standpoint, you won't be appreciated by others that want their experience to be unique as well. Winds are supposed to pick up next week, too. If you want some cross-country, head over toward HD from the descent down from CR. You won't get lost, and if you refer to your map, there is water in the area, as well as a spring on the trail down that will be flowing this time of year if you need it. Even without HD as your objective, it's a nice hike in a nice area. You also save yourselves a re-climb. After that night and HD, then head down and camp at Sunrise instead of LYV. Since you're 1st timer to YNP, do take bear warnings and food storage regulations very seriously. From Upper Cathedral to LYV is prime, and you will almost surely get a couple visits. How that turns out is all a function of how you handle yourselves. For us, and probably you too, the nighttime temps are going to be in the 30s. We'll actually be out about 5 days, so we're adding down jackets and our 0° bags to the gear. Forecast is supposed to be clear, but this time of year you would be foolish to not at least carry some rain gear and pack covers. Afternoon thunderstorms move in fast. 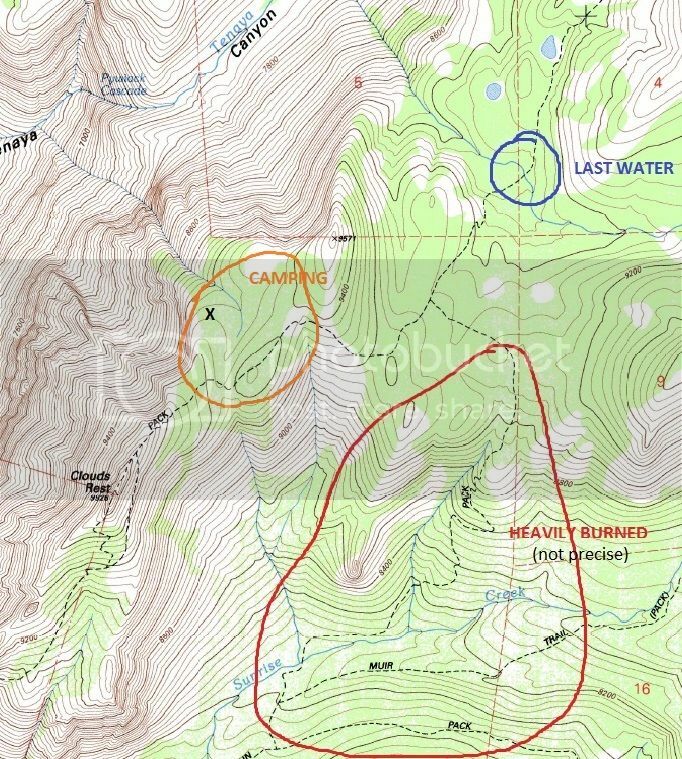 Yes, there are fire rings in most of the sites in that area, but that's not really going to be relevant if you're going up and over CR and coming out at the junction (there are also sites with fire rings there as well). What I was referring to in that quote is uptrail on the JMT a little under 2 miles by the junction of the Forsyth Trail. It's always an option, but it doesn't sound like it's part of the route you planned on. ***MadDiver- since you have that map posted, circle the area where you camped on the way up to CR for him, would you? I don't store photos and stuff online, so I'm at a loss on posting it myself, but I think a lot of people would get a lot of use out of info like that. No prob. As Phil said, you don't really want to camp on top of CR but just below to the North there are plenty of spots, I included and updated map as Phil asked. My spot was somewhere near the "X" about 100yds along the rim of Tenaya Canyon. The forest is very open just go off trail in any direction a little ways and you'll see numerous fire rings. As a bonus, almost no skeeters cuz there's no water! Bam! That's the area, MadDiver. 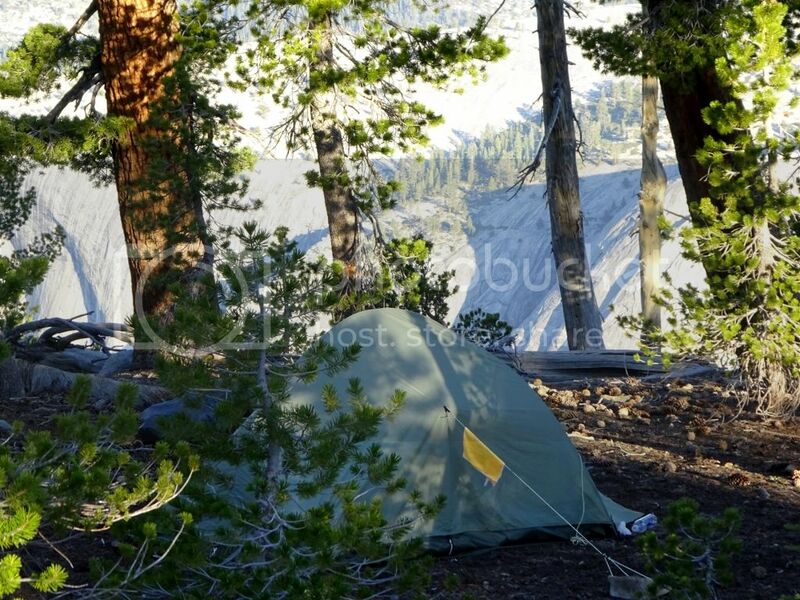 Shelter, shade, flat spot for your tent, close proximity to the summit, great views... won't piss people off. As long as you have plenty of water, what more could you ask for? Great area, highlight of my trip.